Aberrant DNA methylation, in particular promoter hypermethylation and transcriptional silencing of tumor suppressor genes, has an important role in the development of many human cancers, including renal cell carcinoma (RCC). Indeed, apart from mutations in the well studied von Hippel-Lindau gene (VHL), the mutation frequency rates of known tumor suppressor genes in RCC are generally low, but the number of genes found to show frequent inactivation by promoter methylation in RCC continues to grow. Here, we review the genes identified as epigenetically silenced in RCC and their relationship to pathways of tumor development. Increased understanding of RCC epigenetics provides new insights into the molecular pathogenesis of RCC and opportunities for developing novel strategies for the diagnosis, prognosis and management of RCC. Kidney cancers account for about 2% of all cancers, and more than 200,000 new cases of kidney cancer are diagnosed worldwide each year . The most common form of kidney cancer in adults is renal cell carcinoma (RCC). Most RCC cases (approximately 75%) are classified as clear cell (conventional) RCC (ccRCC), and the next most frequent subtype is papillary RCC (pRCC; approximately 15% of all cases) . The most common genetic event in the evolution of sporadic ccRCC is inactivation of the von Hippel-Lindau (VHL) tumor suppressor gene (TSG) [3–6]. VHL inactivation leads to stabilization of the hypoxia-inducible transcription factors HIF-1 and HIF-2 and activation of a wide repertoire of hypoxia response genes . The frequency of VHL mutations in sporadic ccRCC has been reported to be as high as 75% (although VHL mutations are rare in non-clear-cell forms of RCC). In addition to VHL mutations, VHL allele loss of 3p25, resulting in biallelic VHL inactivation, is the most frequent copy number abnormality in ccRCC (as predicted by a classical 'two hit' model of tumorigenesis, where loss of the second allele of a key tumour suppressor is required for tumour formation to occur) [8, 9]. Although the VHL mutations in primary RCC were detected about 16 years ago, attempts to identify other frequently mutated RCC genes have been unsuccessful, with none of the thousands of genes tested so far mutated in over 15% of tumors . TSG inactivation may result from genetic or epigenetic events, and it is well recognized that epigenetic silencing of TSGs has a significant role in the pathogenesis of many, if not all, human cancers. Indeed, promoter methylation and epigenetic silencing of VHL in RCC  was one of the first examples of this phenomenon and so far approximately 60 genes have been suggested to be epigenetically dysregulated in RCC (Table 1). *Where the range of methylation in adjacent (Adj) normal tissue is high across multiple studies, this range is indicated in parentheses before the number analyzed. Abbreviations: APAF1, apoptotic protease activating factor 1; APC, adenomatous polyposis coli; BNC1, basonuclin 1; BTG3, B-cell translocation gene 3; CASP8, caspase 8; CDH1, cadherin 1; CDH13, cadherin 13; COL, collagen; CRBP, retinol binding protein 1, cellular; CST6, cystatin E/M; CXCL, chemokine (C-X-C motif) ligand; DAL, differentially expressed in adenocarcinoma of the lung; DAPK, death-associated protein kinase; DKK, dickkopf; DLC, deleted in liver cancer; ESR, estrogen receptor; FHIT, fragile histidine triad; FLCN, folliculin; GREM, gremlin; GSTP, glutathione s-transferase protein; HOXB, homeobox family B; IGFBP, insulin-like growth factor binding protein; JUP, junction plakoglobin (also called γ-catenin); KTN, keratin; LOXL, lysyl oxidase-like; LSAMP, limbic system-associated membrane protein; MDRI, multiple drug resistance gene; MGMT, O-6-methylguanine-DNA methyltransferase; MT1G, metallothionein 1G; p14ARF, cyclin-dependent kinase inhibitor 2A alternative reading frame; p16INK4, cyclin-dependent kinase inhibitor 2A; PDLIM4, pdz and lim domain protein 4; PML, promyelocytic leukemia; PTGS, prostaglandin-endoperoxide synthase; RARB, retinoic acid receptor beta; RASSF, RAS association domain family; ROBO, roundabout; RPRM, reprimo; SDHB, Succinate dehydrogenase B; SFRP, secreted frizzled related protein; SLIT2, slit homolog 2; SPINT2, serine peptidase inhibitor, Kunitz type, 2; TIMP, Tissue inhibitor of metalloproteases; UCHL, ubiquitin carboxyl-terminal esterase L1; VHL, von Hippel-Lindau tumor suppressor; WIF, Wnt inhibitory factor; XAF, XIAP associated factor. There are two major, interrelated modes of epigenetic regulation in the mammalian genome: cytosine methylation and histone modification. Only cytosine bases located 5' to a guanosine can be methylated, and CpG dinucleotides are generally underrepresented in the genome. However, short regions found frequently in proximal promoter regions are CpG rich . These regions (CpG islands, 0.4 to 4 kb long and found in over 50% of all genes) are generally unmethylated in normal cells but may be hypermethylated in tumors, where CpG island methylation is also associated with histone modification and chromatin remodeling resulting in transcriptional silencing [12–16]. Epigenetic states are, like gene mutations, inherited in cell division but, unlike mutations, DNA methylation and other epigenetic changes are potentially reversible [17, 18]. In a non-disease setting, gene silencing by promoter methylation occurs to regulate the expression of germline and tissue-specific genes and to regulate the monoallelic expression of imprinted genes [19–22]. However, in the past decade it has become accepted that aberrant promoter methylation and the resultant gene silencing can provide a selective advantage to neoplastic cells in the same manner that mutations do [22–26]. Thus, epigenetic silencing of 'gatekeeper' or 'caretaker' TSGs can occur frequently at the earliest stages of cancer initiation, resulting in the clonal evolution of a population of cells at risk of obtaining further genetic or epigenetic lesions [27, 28]. In inherited cancer syndromes such as von Hippel-Lindau disease (associated with susceptibility to RCC) de novo VHL promoter hypermethylation can provide the 'second hit' that initiates tumor development . In such cases methylation is specific to the wild-type allele, suggesting clonal selection for the epigenetic loss of expression. In order to catalog candidate TSGs reported to show tumor-specific region hypermethylation in RCC, we searched PubMed and other online databases (such as PubMeth) . Of the 58 genes that were identified as being methylated in RCC (Table 1, Figure 1; see Table 1 for full gene names), 43 had a mean combined methylation/mutation rate of over 20% and the characteristics of these genes were analyzed in further detail (although 31 genes had been reported only by a single study). Genes methylated in RCC are distributed across the genome. However, there is a concentration of silenced genes at 3p (see text for details). Methylated genes are also concentrated at chromosome 17 and both loss and gain of chromosome 17 have been reported in RCC. Deletions of 3p are frequent in many adult cancers  and occur in 45 to 90% of sporadic RCCs [4, 32, 33]. Inactivation of the 3p25 TSG VHL is of critical importance to the pathogenesis of ccRCC and occurs in up to 86% of tumors . Although VHL mutations are rare in non-clear-cell RCC, VHL methylation has been reported in pRCC and ccRCC [9, 35, 36]. VHL methylation does not associate with tumor stage, consistent with the interpretation that it is an early event in tumor formation [9, 37]. In addition to VHL, several other 3p candidate TSGs have been reported to be methylated in RCC (Figure 1). The RASSF1 gene maps to 3p21, a region of frequent allele loss in RCC and other cancers (including lung, bladder, breast and hepatocellular). Somatic RASSF1A mutations are infrequent in cancer , but RASSF1 is frequently methylated in sporadic RCC (and various other common cancers), either biallelically or as a second hit following 3p deletion [39, 40]. After VHL, RASSF1 methylation has been examined more than any other gene in sporadic RCC, the mean methylation frequency is 51% [34, 35, 38, 41–47]. In a study by Costa et al. , frequent RASSF1A methylation was detected in kidney tissue surrounding the excised tumor. Aberrant methylation in morphologically normal renal tissue adjacent to the tumor (but not in more distant normal tissue) has been interpreted as evidence that the TSG methylation is part of a 'field effect' at an early stage of tumorigenesis that produces a large number of cells with an initial epigenetic lesion that is then followed by additional genetic and/or epigenetic events that lead to tumor development. The candidate tumor suppressor gene TU3A (located at 3p21.1) is frequently downregulated in cancers, most notably prostate cancer  and astrocytoma . In one study of 61 tumors, TU3A was methylated in 42% of ccRCC and 25% of pRCC . The FHIT gene encodes a diadenosine 5',5'''-P1,P3-triphosphate hydrolase involved in purine metabolism. The gene encompasses the common fragile site FRA3B at 3p14. Loss of FHIT is common to many tumor types [51, 52]. In vivo, re-expression of FHIT has tumor suppressing activity . FHIT promoter methylation is common (52 to 53%) in both ccRCC and pRCC [44, 54]. RARB regulates cell proliferation and differentiation and, in common with other 3p TSGs (RARB maps to 3p24), is frequently downregulated or lost in multiple tumor types. However, several small studies have found RARB to be methylated in less than 20% of RCC cases [35, 42, 44, 55]. Dysregulation of the WNT/β-catenin pathway is common in a variety of cancers, and oncogenic activation of this pathway drives the expression of genes that contribute to proliferation, survival and invasion [56, 57]. Inhibitors of WNT signaling can be divided into two functional classes: the SFRP proteins, which bind directly to WNT, preventing its binding to the FZ receptor , and the Dickkopf (DKK) proteins, which bind to the Low-density lipoprotein receptor-related protein 5 (LRP5)-LRP6 component of the Wnt receptor complex . The SFRP1, SFRP2, SFRP4, SFRP5 and related WIF1 genes are all frequently methylated in RCC (47 to 73%) [60–64], as are the Dickkopf genes DKK1, DKK2 and DKK3 (44 to 58%) [63–66]. Recently, SFRP1 was shown to be overexpressed in metastatic RCC compared with non-metastatic tumors, in which expression was often attenuated by promoter methylation . As described above, germline VHL mutations cause inherited RCC and VHL inactivation is also critical to the development of most ccRCC. Similarly, a constitutional translocation associated with RCC susceptibility disrupted the NORE1A (RASSF5) and LSAMP1 genes, and both genes were epigenetically inactivated in sporadic RCC . However, somatic inactivation (by mutation or methylation) of other genes associated with inherited kidney cancer, such as FLCN, FH and SDHB, is infrequent or absent (Table 1). Nevertheless, SPINT2 (HAI2), which encodes a secreted inhibitor of MET activity (activating mutations in the MET proto-oncogene are associated with familial pRCC, although somatic mutations are infrequent in sporadic pRCC [69, 70]), was found to be methylated in 30% of ccRCC and 45% of pRCC . This observation demonstrates how TSG methylation can target familial RCC gene pathways. We note that several other epigenetically inactivated candidate TSGs, including members of the Wnt regulatory pathway , p16INK4a , CASP8 , GREM1 , RPRM , collagens , IGFBP1 , IGFBP3  and PTGS2 , can be related to VHL-regulated pathways. However, genes involved in many other cellular processes have also been found to be epigenetically silenced in RCC (Table 1). Compared with the results of high-throughput sequencing studies of RCC , it seems that epigenetic studies have provided a much higher number of frequently inactivated candidate TSGs. Nevertheless, a combination of sequencing and epigenetic analysis provides the optimum strategy. Thus, although RASSF1A would not have been identified as an important RCC TSG by sequencing analysis alone, CDKN2A (which is mutated in approximately 10% of RCC and is the second most highly mutated gene in RCC ), is, on average, methylated in 11% of RCC [35, 36, 41, 43, 44, 55, 82], yielding a combined inactivation rate of about 21%. A wide variety of methodological approaches can be used to determine the promoter methylation status of candidate RCC TSGs and these have differing advantages and drawbacks (Tables 2 and 3). In addition to the detection of pathological promoter region methylation, it is important to demonstrate that this is associated with transcriptional silencing of the candidate TSG. Correlating correct methylated site to expression regulation is laborious. Cell lines are frequently more methylated than the corresponding tumors. The functional epigenomics strategy uses 5-aza-2'-deoxycytidine treatment of cancer cell lines to identify genes whose expression is reactivated following demethylation. Although this strategy can provide an unbiased approach to identifying candidate epigenetically inactivated TSGs, only a minority of the re-expressed genes are ultimately proven to be silenced in primary tumors. Some techniques, such as methylation-specific PCR, can be very sensitive, and it is reassuring when results are available from a large number of tumors and multiple studies because the frequencies of methylation for individual genes can show considerable variation (Table 1). Such variation can reflect differences between cohorts of tumor samples or methylation detection methodologies, and only in a minority of cases are there data available from multiple studies and over 100 tumor samples. For less well studied genes the evidence for pathogenicity is strengthened by reports of frequent tumor-specific methylation (or mutations) in other tumor types; this is the case for BNC1 , PDLIM4 [84, 85], CST6 [86, 87]SLIT2 [88, 89], IGFBP3 [90, 91] and SPINT2 [92–94]. So far, epigenetic studies in RCC have concentrated on the methylation of CpG islands at or near to gene promoters. Recent studies in colorectal cancer have indicated that methylation extends well beyond discrete islands. Indeed, approximately 50% of these 'CpG island shores' were found more than 2 kb from the nearest annotated gene . As with CpG island methylation, CpG shore methylation inversely correlates with gene expression. Further investigation of global genomic methylation patterns is necessary to elucidate the full role of epigenetic gene silencing (and oncogene activation) in RCC development. It is now accepted that in certain tumor types, colorectal being the best described, a subset of tumors show a CpG island methylator phenotype (CIMP+), which associates with specific lesions such as BRAF mutations and microsatellite instability . However, the relevance of the CIMP+ phenotype to RCC has not yet been clearly defined . The role of abnormal histone modification as an epigenetic factor in RCC development also remains to be investigated in depth. 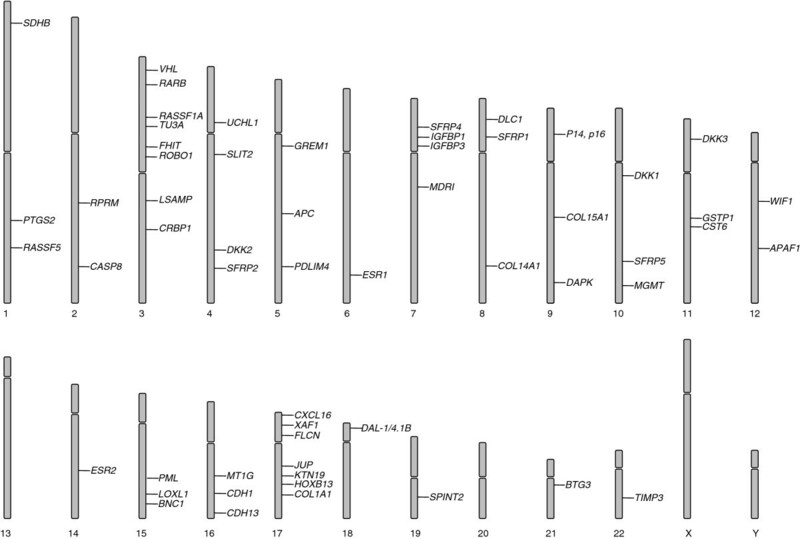 However, recent large-scale sequencing screens of RCC revealed mutations in the histone-modifying genes ubiquitously transcribed tetratricopeptide repeat gene on × chromosome (UTX), set domain-containing protein 2 (SETD2) and lysine-specific demethylase 5C (KDM5C, JARID1C), and that loss of these genes correlated with transcriptional deregulation [81, 98]. The interplay between erroneous histone modification and aberrant DNA methylation in the evolution of RCC merits further investigation. Methylated TSGs provide attractive options for biomarkers for the detection and prognosis prediction of cancers, including RCC . DNA-based assays are often more robust than RNA-based assays, and whereas the mutation spectrum causing TSG inactivation is usually diverse (which limits the utility of mutation-specific detection strategies for tumor screening programs), TSG inactivation by promoter hypermethylation provides a more homogeneous target for molecular screening strategies. So far, large-scale gene sequencing studies have demonstrated that, with the exception of VHL, there are no genes that are mutated very frequently, but a significant number of genes do show frequent tumor-specific methylation. Early diagnosis of RCC can be challenging. The classical clinical symptoms and signs of renal cancer are usually present only with late disease, when prognosis is poor; these symptoms - pain, palpable flank mass and hematuria - are present in only approximately 10% of patients . The aim is to detect RCC early when the tumor is still confined, as this has a significant impact on long-term disease-free survival. Although an increasing number of RCCs are detected as incidental findings on abdominal imaging, distinguishing benign and malignant masses in such a situation can be difficult. However, DNA can be detected from cells sloughed from the tumor into urine or blood, and three studies [41–43] have successfully detected the presence of promoter methylation, by methylation-specific PCR, from DNA extracted from serum and urine of patients with RCC. Methylation of the Wnt antagonists SFRP1, SFRP2, SFRP4, SFRP5, DKK3 and WIF1 was detected in tumor DNA in the serum of patients in whom those genes were methylated in their tumor. Moreover, the frequency of methylation detection in serum correlated significantly with increased grade and stage, suggesting that detection of these methylation-specific PCR products may be useful as markers of tumor progression . Using a panel of previously identified RCC-specific methylated genes, two of these studies [41, 43] have found a strong correlation between tumor methylation and methylated DNA obtained from patient urine. Methylation was not found in control, age-matched urine samples. The panels of genes used in these studies included VHL, RASSF1, MGMT, GSTP1, p16INK4, p14ARF, APC and TIMP3. The specificity for genes such as VHL and RASSF1, which are frequently methylated and believed to be inactivated at an early stage of tumor development, suggests that methylation-specific PCR-based hypermethylation panel arrays could have potential as an economically viable early detection screen for patients presenting non-specific symptoms and for distinguishing benign and malign renal masses. Only a few genes that might have potential as prognostic biomarkers have been analyzed in urine or blood from RCC patients. However, the tumor methylation status of several TSGs has been correlated with prognosis. Two independent studies [63, 64] have reported an inverse correlation between SFRP1 promoter methylation and patient survival (in vitro and in vivo assays both suggested that SFRP1 had tumor suppressing activity in RCC [62, 64]). Methylation of COL14A1 and BNC1 was significantly associated with a poorer prognosis and this was a better prognostic indicator than tumor stage or grade . JUP methylation was detected in a very high proportion of tumors tested (91%) and was reported to be an independent indicator of disease progression and patient survival . Similarly, a significant correlation between methylation of the bone morphogenetic protein antagonist GREM1 and tumor grade and stage and poor prognosis was reported , and methylation of TU3A was significantly associated with advanced tumor stage (later than stage T2) and poor survival . The methylation status of several TSGs has been correlated with tumor pathological characteristics but not prognosis. HOXB13 methylation, for example, was correlated with tumor grade, stage, size and microvessel invasion , whereas DKK1 methylation correlated with increased pathological grade  and DKK2 methylation correlated with both increased stage and grade . However, most of these studies require replication and, although RASSF1 methylation was reported to correlate with stage [44, 46] and grade , the largest study so far found no correlation with grade . Clearly it is important that there should be further studies of potential methylated biomarkers in tumor tissue and urine and/or blood with the ultimate aim of producing a panel of biomarkers that will enable non-invasive detection, molecular staging and prediction of prognosis. As the number of potential methylated TSG biomarkers increases, it will be of great importance to assay these in a standardized manner in prospective studies to establish their clinical utility. The identification of frequently methylated RCC TSGs highlights critical pathways that could potentially be targeted for novel therapeutic interventions in RCC and other cancer types. In addition, there are less gene-specific approaches to epigenetic therapy. Decitabine, the clinical form of the demethylating agent 5-aza-2'-deoxycytidine, has been investigated in several clinical trials for neoplasia, and promising responses have been reported in hematological malignancies (such as myelodysplastic syndrome [18, 104, 105]), although the response rates seem to be lower for common solid tumors. However, epigenetic therapy to alter cancer methylation or histone modification status is an area of increasing clinical trial activity. Clearly, strategies such as tumor methylation profiling, which could identify cancer patients most likely to respond to such therapies, would be a major advance. Technological advances are accelerating the pace of methylation profiling for common human cancers. The advent of high-throughput hybridization-based assays can allow the methylation status of around 14,000 genes to be analyzed simultaneously (although only a few CpGs are interrogated for each gene) and strategies based on second generation massively parallel sequencing technologies will undoubtedly provide a more complete assessment of RCC epigenetics and elucidate novel RCC TSGs. One advantage of these approaches over the older 'candidate gene epigenetic status approach' is that the simultaneous analysis of many genes allows a better comparison of TSG methylation frequencies for specific genes and is likely to facilitate comparison between different studies. With increasing numbers of methylated TSGs in RCC identified, our knowledge of the molecular pathogenesis of RCC will increase and with it the potential for developing novel biomarkers and potential therapeutic interventions. Both authors contributed to manuscript preparation and editing.